Attention on site is starting to focus on the ‘fill’ layers found beneath the plaza. Today it became clear that these consist in part of collapsed walls, from the buildings demolished to construct the plaza. They also contain a large number of amphora fragments and other pieces of pottery, which, along with coins, will provide good indicators of the date of the fill, and so of the plaza itself. However, we now seem to be dealing with at least two main phases for the plaza. The first should be contemporary with the enormous porticoed facade which lines the street in front of our square: this structure is likely to have been built to serve as the monumental entrance of the complex. The second phase involved the demolition of the rear of this portico, so that only the street facade remained, without a vaulted corridor behind. This demolition removed the back row of piers down to the level of the new plaza. Nevertheless, the presence of some re-used building material in the demolished piers at the rear of the portico suggests our phasing is even more complex than that! 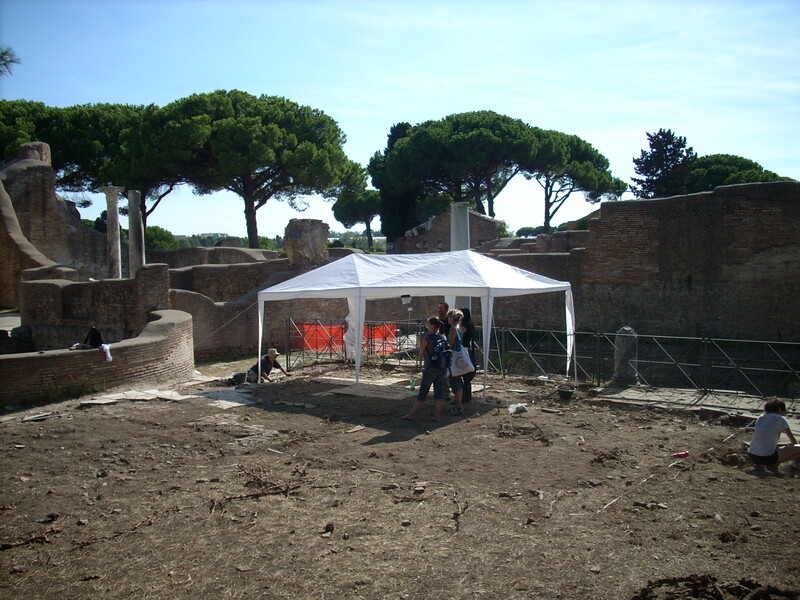 We have now been digging at Ostia for over a week. The initial costs of establishing the project have been huge and mainly unanticipated – from extra toilets on the campsite, to tarpaulins to cover the dig-site. Added to this has been the cost of extra equipment caused by the delays in delivery and the last minute cancellation of a loan of digging equipment, four days before the project began. In short, a logistical nightmare, involving great expense. But the first glimmers of light appeared today. The site tours went rather better than yesterday, making around 65 euros – enough to cover lunch and dinner for the group. Americans and Germans are of course particularly generous, and surprisingly well-informed. The best moment for them is we bring out selected finds to show them – then they really are hooked: the broken foot of a roman glass goblet has attracted lots of attention . Such site visits have restored a sense of excitement to the dig, which the diggers badly need, as exhaustion is beginning to creep in. Great blog guys! And good luck with the project. 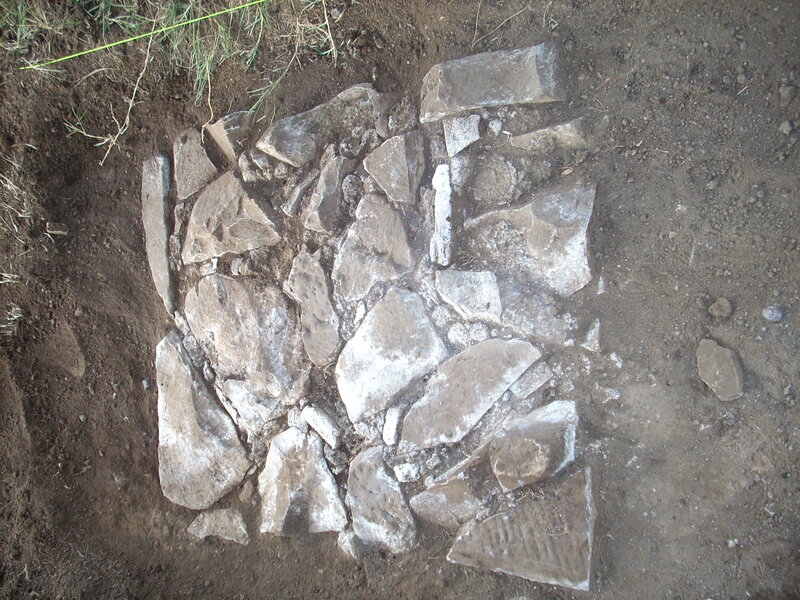 What a great idea to set up this blog about the dig! 150+ members of the Ostia mailing list know about it and I’m sure that many of them visit this place on the web. The inscription seems to read loculus, no? Keep up the good work, kill them mosquitoes, and when in Bar Tharros plz say hello to Aldo! You’re doing great work. How can we make donations? Yes, in the inscription we have a Proculus of course, as remarked elsewhere (a response in Finds). keep up the posts and good luck to the team! By the way, any map references to the site to find it on google maps?